The Rittreck/Optika is a 6×9cm SLR with a horizontal non-revolving back released in 1955 by Musashino Kōki. The most common models are the Rittreck IIA and Rittreck SP. 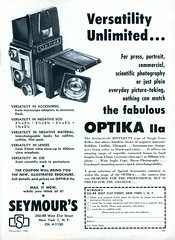 The Optika IIA was a variant of the Rittreck IIA, sold by Seymour's, a distributor based in New York. It is one of the only 6x9cm single lens reflex cameras ever built. The standard lens was a Luminant 105mm f/3.5 and the "wide" lens was only slightly wider at 92mm since the so called RetroFocus lenses allowing wide angle lenses in mirrored reflex cameras were only built up to 6x7cm cameras and some years later (Mamiya RB). The normal and wide angle lenses have a very rudimentary preset device (a ring) to speed up the action of changing from the open diaphragm to the one previously selected before taking the picture. It is much slower and less efficient than the later auto diaphragm settings found in almost all 35mm and many medium format single lens reflex cameras. Even the later Graflex large format SLR cameras around the same period had a much more convenient inner operated auto diaphragm setting on the back of the lens boards. (These models can be recognised by a sign indicating the automatic diaphragm operation). There were longer lenses available up to 400mm. Each lens was mounted on interchangeable lens boards. The "wide" lens had a slightly recessed lens board. Besides backs for cut film and film packs there were 3 types of rollfilm holders. Type II was the most advanced type with a removable inner holder and a place for storing 2 spare film rolls. It gave 8 pictures at 6x9cm from type 120 rollfilm (type 220 rollfilm was not yet available) and had an automatic stop after each frame requiring a lever to be pushed to allow transport to the next frame. Type I rollfilm holder had no removable insert and no automatic stop after each frame as it allowed 3 formats: 10 pictures at 6x7cm, and with masks replacing the dark slide either 12 pictures at 6x6cm or 15 pictures at 4.5x6cm per roll of 120 film. However, instead of the red window showing the printed numbers on the backing paper of 120 rollfilm found in other multi-format rollfilm holders like those made by Rada and Mamiya for their Press series cameras, the type I Rittreck holder had 3 film counters on the top of the holder, one for each format. Film advancing was achieved by simply turning a knob and checking with the corresponding window when to stop and take a shot. The type III rollfilm holder existed in 3 versions, with a separate one for each format: 6x7cm, 6x6cm and 4.5x6cm. All versions had an automatic stop after each frame. Like the type II, there was a small lever that had to be pushed to advance the film to the next exposure. Users of the Rittreck/Optika cameras had to get used to the uniquely problematic fact that the exposed 120 film was wound opposite to the conventional way, with the backing paper on the inside of the spool and the light sensitive film side on the outside. This was potentially very inconvenient as the developer could not see the kind of film inside (colour negative, slide, black and white, etc.) and would therefore not know corresponding chemicals that would be needed to process the film. As a solution to this problem, the film could be re-spooled so that the backing paper was on the outside. The safest way of doing so was to re-spool the film in complete darkness to prevent any external light from fogging the film. Other accessories available at the time for the Rittreck/Optika cameras were intermediate extension tubes for closeup and macro photography and a finder with 45 degree mirror that replaced the standard folding hood finder. Most cameras had a single shutter speed dial with either 1/400s or 1/500s as the top speed but some models (mainly the SP) featured a separate dial for slower speeds. Another special feature of some models was a unique system to absorb the mirror shock which had to be set separately for normal landscape horizontal pictures and portrait vertical shots, which was only possible by turning the camera body 90 degrees since the back did not rotate. The 6x9cm focusing screen is a bright, high quality screen with a Fresnel lens to increase overall brightness and has clear frame-lines showing 6x7cm, 6x6cm and 4.5x6cm formats. The Rittreck/Optika 6x9cm cameras and original lenses and accessories were not manufactured in large quantities. However listings for roll film holders appear online at various auctions sites from time to time as they were also sold for large format folding type Rittreck cameras later replaced by those which are still being sold to this day under the Wista brand. Musashino Koki M.K.K. became the present Wista Co. Ltd, but they have no spare parts for older Rittreck cameras, and can now only be found online at various auctions sites. Lewis, Gordon, ed. The History of the Japanese Camera. Rochester, N.Y.: George Eastman House, International Museum of Photography & Film, 1991. ISBN 0-935398-17-1 (paper), ISBN 0-935398-16-3 (hard). P.94.